I have often complained about the lack of suitable animations in Second Life of use to a designer of mechanical items, such as myself. I have often complained at quite tedious length, in fact; I was doing so just yesterday. The issue is that the standard method of creating these thing is a program called Poser, which I'm sure is a fine piece of software but seems not only over-featured for use with SL, but also overpriced. I was therefore extremely pleased to come across a forum thread devoted to a free animation production program called Avimator. It is claimed that it is still in an early stage of development but I found it perfectly adequate and, indeed, intuitive for the production of custom animations and poses. For instance, my Mk909 Engine Rifle and swordstick (both unreleased at this stage) now have holding poses more suitable for their designs than the standard, and I produced a "lunge" animation for the swordstick far more appropriate than the existing "sword_slash_r" (only a very poor fencer would swish their blade about in such a manner). 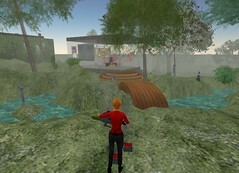 Those who publish pieces regarding Second Life on the internet will be interested to learn of a service known as SLurl, which allows once to easily link to a location in Second Life and have the viewer taken to a map of it and given the option to visit, whether they have the Second Life client installed or not. which one would hope that anyone could construct. 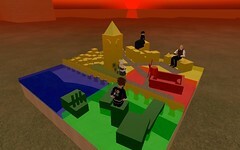 However, the building of a customised SLurl that utilises the full range of other options is somewhat time-consuming and a little daunting to the novice. To save time in this matter, I have created what seems to me a useful web page that allows one to simply fill in the blanks on a form and produce a SLurl. It is called SLurlBuilder. Please feel free to use it as desired. If anyone was concerned with the progress of my paper aeroplane investigations, I can announce that I did, in the end, come up with a design for the aeroplanes that seems to provide reasonable results. Rather than calculating the angle of attack each time, I simply assumed that it would always be zero given that the plane does turn to face its direction of movement anyway. The plane now basically works with lift and drag, both proportional to the velocity. Lift applies in its local Z-axis, and drag in its local X-axis. Using llSetForce with the local flag set really does save a lot of time as far as calculating the correct co-ordinates is concerned. The resulting item is now available at Ordinal Laboratories, but one can also scan the aeroplane code here and now should one wish (pretty colourised HTML version). I think, though, that it could be improved. Dear reader, what is it that you would most like to see from a champagne device? I'm at a bit of a loss for ideas for improvement. Incidentally, I would hope that no visitors consume so much champagne that they come to believe that damaging the highly volatile fuel tank on the dirigible deck is a good idea. A few impacts from high-velocity items such as bullets and... well, I'm not responsible for the consequences, and my lawyers confirm this. I would also appreciate it if they did not use the high-speed transit chairs if their stomachs are feeling a tad unstable, as there is nobody to clean the area apart from myself, and I am a modern woman who does not feel it is her place to do such a thing. We are not living in the eighteenth century any more. I trust that anyone becoming ill after a jaunt will bring their own mop and bucket. More practically, I note that folk are still complaining about the interference of ne'r-do-wells in their home areas, and I agree that it is most improper occurrence should someone return again and again to taunt a lady or gentlemen, and take photographs of their bedroom activities, which I am informed is a common pastime of such people. With this in mind there is now a Defensive Panopticon available, easily updatable with specific names, that warns one when any of those on the list of unwelcome people is around. Of course, there is always the ban tool on a land parcel, but that does not help anyone who has chosen to make their home some way above the ground, and if one has a somewhat small area it is quite possible for a ruffian to sit very close and listen in to one's private conversations. For this reason, the Panopticon alerts people whenever offenders come within ninety-six metres, over one's land or not, and has the potential (if so desired) to eject them at any altitude should they trespass. I have often pledged never to produce any so-called "security" item that is indiscriminate in its effects, throwing pilots out of aeroplanes and so forth, but one which requires specific names to be added I feel is quite legitimate. This is a simple device, which I designed some time ago, and have been meaning to release for some time once it has developed a friendlier interface. It must be said that it might be considered somewhat, well, intimidating in appearance. 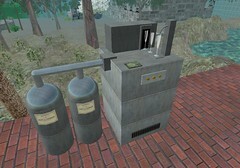 Vending devices in Second Life are often distinctly brusque and indeed even rude, as well as being festooned with garish floating text. Last night, whilst designing a device of similar purpose for my own potential use - I have not made up my mind - I decided that in any case mine would be more polite. A perpetual problem for myself and others whose body clocks are tuned to Greenwich Mean Time is that of communication with other residents of Second Life. A gap of eight hours between London and the Western coast of the Americas means that, when dealing with those resident in the Colonies, one spends much of one's time asleep when they are awake, and then wakes and is eager to speak, but is unable to actually enter Second Life due to the demands of work and has to wait for many hours, tapping fingers irritably and perhaps forgetting what one meant to say. There are also other occasions when one is trapped in the Other World for extended periods - say, on account of one's Powerbook having broken down again - with access to email but not to Second Life itself. It would be nice to be able to at least initiate messages, and at the moment one cannot do this. Most people are aware that instant messages from within Second Life can be forwarded as email, and many of those people are also aware that replying to the email will send an instant message back. What fewer people are aware of is that the address that one replies to is actually only a temporary session one, and is not reliable for long term use. Normally, to send an email into Second Life one addresses it to key-of-the-recipient@lsl.secondlife.com, and when one receives an email from an instant message, the reply address is similarly key-of-the-sender@lsl.secondlife.com. And that's all well and good when dealing with objects. Objects retain their key indefinitely, so I can save the key of an object somewhere, send it emails until the end of the world at the same address and it will always pick them up. But this does not work for communicating with people - the value of key-of-the-sender above when they send you email via IM is not their actual key. I am not sure whether addressing mail to actual-avatar-key-of-the-recipient@lsl.secondlife.com works, but it's inconvenient to carry around an address book, or keyring I suppose, full of impossible-to-remember keys. If this doesn't work, and it's only temporary keys that do, which may be an attempt to limit people harassing others via email sent from the Other World (laudable intention, annoying results for me) there is no way to initiate a conversation from outside. Jefferson Gould//Mr Watson - come here! Email-IM Gateway: Mr Watson - come here! "Aha!" I hear those of you who script thinking, "How does it know the proper key just from the name Jefferson Gould? You need a key to send a message with llInstantMessage. You're cheating, aren't you?" Er, that's the problem really. There is no way of getting a key directly from a name in LSL. So I have to have keys and names listed in a notecard, and the script reads through the lines of the notecard until it finds the right name, then takes the key from that. Which is a pain because they need gathering first, which means that I won't be able to send an email to anyone whose key I have not already obtained, unless I can find a public key database somewhere. I've not tested the script for this so I won't post it up right now - in any case this entry is getting rather long. Once I do so, though, I will, and also the script for the key harvester that I use, and they'll be in the showroom as usual, which could get a bit crowded. Maybe I should script a vendor too so that not all of these things need to have their own prims, even if I do quite like the current layout. The issue of keys and names is an interesting one. People do feel protective about their keys being recorded. I wonder how much of that is just simple suspicion at surveillance. Perhaps that's something for another entry. *thinks* I might integrate this into my existing "contact me" object, to produce a Multi-Functional Communications Engine. Edit: I've been informed that there are public name to key databases in existence that can be used for this purpose - for instance, the one maintained by Ulrika Zugzwang or this one on w-hat.com. These are not entirely complete, and would take a long time for a script to search if fully included - but the public web lookup pages give one the option of finding a key from a name and then sending to that. I shall modify the script so that one can specify either a key or a name to send to. I have changed the manner in which my showroom operates. Instead of having a few free things and the rest being all very cheap (nothing over L$50), items are now either free or cost L$1 - the latter helping me keep records of who has bought what. In the corner is the Lurking Crate, which reacts... unusually for a crate, when approached. This contains random items that I've designed but which aren't serious or detailed or working well enough to warrant my building a whole retail box for them. These are all free. // from Ordinal Malaprop via dispenser in my home area or directly. // - it is not sold BY ITSELF, UNMODIFIED. // script yourself, but that's not part of the licence. If you are a past customer and I have not already contacted you regarding a refund, do please let me know and I will send you back the difference in prices. The only real income that my establishment will now generate is via the tip jar. If anyone feels that products from here are useful or entertaining or otherwise worth something, and feels like expressing their appreciation, that is one option. One could also rate me up if one was moved to spend - I do appreciate this as well. My lovely Powerbook has just this afternoon gone in for repair, and may be some time (well, hopefully it will be back before the end of the week). Until then however I will not be Second Living, so don't complain if you need to speak to me and I'm not around. My last act was to modify the rocket mentioned below so that it fires out submunitions on detonation which themselves detonate in random colours half a second later, providing a rather extensive and messy shower of particles. Well, colour me an embarrassed shade of mauve - after lots of faffing about with llSetTorque et cie, I find that llRotLookAt does work with physical objects, it's just that you need rather inflated parameters to get it to do anything. And thus we have a rocket that now moves to point in its direction of travel, calculating the rotation between its forward axis and the velocity using llRotBetween, multiplying that by its actual rotation and then turning there. Don't ask me how that works. I really don't understand rotations very well, still, I'm afraid. 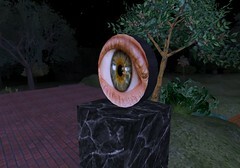 I got a lot of that from the wiki page about llLookAt. 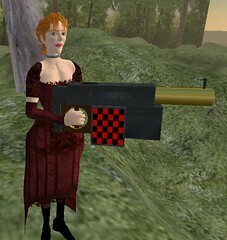 I also added a longer detection spike, to let the maximum speed go up a bit, and added a little more flash to the launcher - now, once you run out of ammunition, the Harlequin ejects the empty cartridge (which bounces about for a bit on the ground and emits smoke) and you go through a reloading animation. I think it looks rather good, personally. What remains is to give the rockets a slight heat-seeking element, pointing them a little towards the nearest avatar. This will probably just make them miss, but should help at long ranges. Not that I can see anything past 96m in any case. Readers interested in Victoriana, steampunk or just good taste and design might be interested to see the preliminary model of a dedicated steampunk sim that is being planned at this very moment. This impressive maquette was built by Professor Jefferson Gould and continues to grow every day. If all goes to plan I shall personally be involved in the scripting of some of the infrastructure - automated hansom cabs, balloon tours, communications, that sort of thing. Obviously there needs to be investment in the project, but given that everywhere that the model goes people, flock around it and make comments such as "that looks great, when can I visit? ", "I'd rent a house in a place like that", "I'd love to set up a shop/gallery/other there" I believe that it would definitely be economically viable. There will be more publicity for it in coming weeks, but for now, here are a few photographs. You can see the full-size model quite frequently on evenings in Cordova Sandbox; I'd host it myself but alas, I do not have the spare prims in my home area. Edit: The model has found a home at Acontia 52,186,86 - click to visit it. To see the whole collection of pictures, including the latest design, visit my gallery on the subject. Edit: Turning problems detailed in this post have been solved, and some of the conclusions proved incorrect - see above. One would think that llLookAt and llRotLookAt would be the ideal functions for use with a guided physical projectile that one wishes to have pointing in a certain direction. Certainly, in the wiki, it says "this function works for both physical and non-physical objects". Does it? No, unless I'm doing something horribly wrong. (a) accelerates constantly in the direction that it is pointing until it runs out of fuel. This is fairly straightforward, it just requires using llSetForce. I added in a drag co-efficient that represents air resistance, proportional to the current velocity, as well, so as to limit the speed. (b) moves to point in the direction that it is moving in, more or less. (Aerodynamic objects tend to do this - think paper aeroplanes.) It's easy to make vehicles do this, there are automatic parameters to set, but for physical objects I can't see any mechanism apart from applying a force or impulse myself. And that's where I'm having the problem. On entry, gFuel is set to gFuelMax, and gMaxSpeed... well, that is set to llGetRegionFPS() * 1.5. Why? Well, the rocket itself has an invisible central prim that is 1.5m long, for collision detection, and I am assuming that llGetRegionFPS() will give me the physics framerate. Any faster than the above and there will be "gaps" between the positions of the rocket meaning that a collision might not be detected. See the previous post that I made about bullets for more on this. The value of the vector drag varies depending on the current velocity, and is a push in the opposite direction to the rocket's current movement - note, not the direction parameter sent to the function. At maximum speed, drag will have a magnitude of 1, which should cancel out the rocket motor if that is acting in that direction. Okay, the drag should really be different for different directions, since the forward drag on a rocket is much less than the drag on other axes, but give me a break, it's only alive for a few seconds. Er, I mean, that's an optional project for advanced students. That all works fairly well it seems. 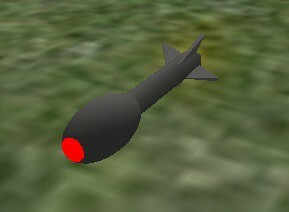 The problem is that the rocket should really turn in the direction of movement - real rockets do that. Only I can't seem to get that working. I can't use llSetRot, that's only for non-physical objects, and when I try to use llLookAt or llRotLookAt, they just don't do anything at all. I tried building a sensor object that used those functions to look at the nearest avatar to test this. When it was non-physical, it turned fine (and I've used this many times before). When it was physical, it just didn't move. I don't know if I'm screwing up some parameters or not - I'm sure I've used llLookAt with physical objects before - but it is annoying me greatly at the moment. Once I find a solution (if ever) that doesn't involve the use of llApplyRotationalImpulse, which I don't understand and which scares me, I'll post something on the matter. As a post scriptum, hold_R_bazooka is all very well as an animation, but why on earth does aim_R_bazooka have to involve your left hand entirely changing position? Two outages within twenty four hours? 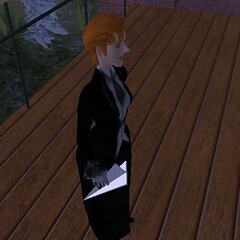 I am entitled to permanent service from Linden Labs, all day, every day. God dammit, I pay their wages. Haven't they ever heard of customer service? I demand compensation for this outrage. It just isn't good enough. Linden Labs are a disgrace. They release clients with critical flaws like, um, the display box in llDialog() being one whole line smaller now - they destroy my grid-famous Avtrap Mall by introducing point-to-point teleporting - and they're going to cripple the TringoChairCasino that I built just to help newbies, out of the goodness of my heart, by removing DI. They're stealing from me. This is theft. They're like some sort of Communists! WHERE IS MY MONEY, LINDEN LABS? I'm going to hold my breath until I get it. That's just off the top of my head right now so there may be the odd bug, but I think the basic idea is sound. One other thing that I have learnt recently is that I'm getting much too involved in certain factional fighting, and it's causing me to make mistakes and bother people who are uninvolved. It's also getting in the way of other things that I am doing. I don't want this to happen, so I'm going to pull back - I'll provide scripting support, alerts, presence loggers (not chat loggers, no, that's against ToS if you're not there and they don't consent) etc but I'm not taking an active part any more. I've had enough of building weapon delivery systems; after I've fulfilled the responsibilities that I already have, I might build a sandwich delivery system.